THE IRISH ECONOMY has delivered some “exceptionally strong” numbers in the latest quarter and is likely to smash forecasts for the year. But the long-term underinvestment in everything from health to housing will bite even harder in the coming years as the country’s population swells. The latest CSO national account figures, both gross domestic product (GDP) and gross national product (GNP) jumped 1.9% during the three months to the end of June. Compared to the same quarter in 2014, GDP was up a massive 6.7% while GNP – often considered a better measure of the underlying strength of the economy – increased 5.3% on 12 months earlier. Every segment of the economy recorded a rise in output value during the quarter with the industrial sector delivering the biggest increase. In a briefing note, Davy chief economist Conall Mac Coille said the figures were “exceptionally strong” and suggested the economy would grow more than 6% for the year. The underlying picture is that the natural bounce back in the economy has been accentuated by the weak euro stimulating exports and low oil prices and tax cuts helping real incomes,” he said. Even if GDP was flat for the entire second half of the year, annual growth would be 5.7%, well ahead of the Central Bank’s most recent prediction of 4.1% growth for the year. However forecasters have said it could still be a while before the increases, which have made Ireland easily the fastest growing economy in Europe, translate into meaningful pay increases for most workers. While the country’s economy should overtake its pre-recession peak this year, unemployment remains stubbornly high and in recent months the number of people taking up jobs has stalled. Business lobby group Ibec predicted an improving jobs market would lure more emigrants home and that, coupled with high population growth, would put pressure on already stretched infrastructure. “The reality is we are in danger of making the same mistakes we made in the late 1990s, of underestimating the turnaround in the economy and not investing ambitiously enough,” CEO Danny McCoy said. 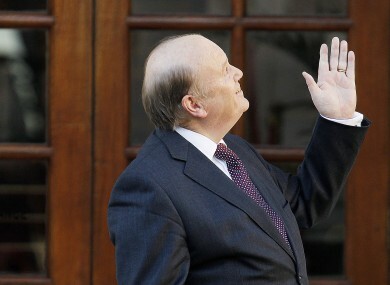 Earlier, Finance Minister Michael Noonan said the latest growth figures were “extremely positive”. “The increase in economic activity is broadly-based – unlike in the past when activity was excessively concentrated in the construction sector we are now seeing both domestic-facing and exporting sectors performing strongly,” he said. Email “There are few clouds on the horizon for the Irish economy right now”. Feedback on “There are few clouds on the horizon for the Irish economy right now”.